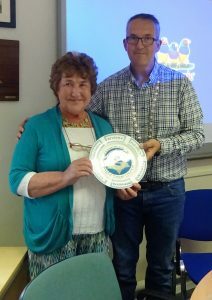 Following receipt of the news that former Mayor’s Award winner Margaret Tanner would be leaving Hayle to support her family in Ireland, the town council decided to honour her by presenting her with a town plate as a mark of recognition of all her many years of service to the town. At the full council meeting of 6 July 2017 members of the public crowded the Assembly Room to speak about Mrs Tanner during Public Participation. John Bennett, resident and former mayor, explained that he did not wish to steal the mayor’s thunder but wanted to say a few words about Margaret Tanner and her contribution to the town. He said that he had worked with her on several projects and that she had done so much more than most would ever achieve and that she would be missed by everyone. Jayne Ninnes, resident and also a former mayor, wanted to thank Mrs Tanner for all she had done for Hayle. She had worked closely with Margaret, especially at the food bank, and had had the pleasure of selecting her to be Citizen of the Year during her tenure as mayor. She added, making reference to Margaret’s Irish heritage, that immigration was fabulous! Rev Samuel Marsden simply said “Ditto” and Chris Berry explained that he too had worked closely with Margaret over the years and more recently on the ‘Open the Book’ project. He said that she would be sorely missed. 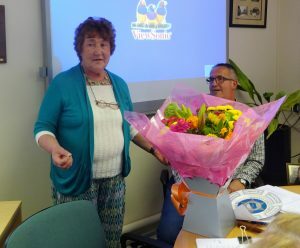 During the formal part of the meeting the mayor explained that the council had invited Margaret to attend the meeting so that they could all thank her for everything she had achieved in and given to the town. Margaret had had a hand in everything that was good in the town and he went on to list a number of community organisations and events that she had been involved in or with, which included the food bank, Hayle Decorative Lighting, the raft race, Hayle in Bloom, Churches Together, Cancer Research UK, St Joseph’s Church and, of course, the wonderful Hayle Celebration Day. The mayor told Margaret that she could leave Hayle with her head held high knowing that she had given so much to the town and was an example to us all, adding that Hayle was better for her hard work. He presented Margaret with a town plate and a bouquet of flowers. Margaret thanked the mayor and summarised her many activities in the town. She also detailed how she had first come to the town and how she had grown to love the town where she had worked, met her husband and raised her family. She thanked the mayor again and everyone in the room.